NCPH’s Advocacy Committee is charged with a dual mission: to respond to calls to take a stand on pressing issues of the day, and also to recommend proactive positions and actions to advance NCPH’s goals of advocating for public history and its practitioners. The first part of the mission, that of advocating reactively around challenges and issues, has had its capacity enhanced by the addition of new members to the committee. The committee is made up of board members, including all members of the Executive Committee of the board, and now also includes nonvoting members from the general membership. We continue to sign on to statements from other organizations such as the National Coalition for History and the American Historical Association, and we write our own statements to articulate NCPH’s positions on issues of the day, for example on the University of North Carolina’s handling of the “Silent Sam” Confederate monument. The second part of the committee’s charge—aligning with NCPH’s Long Range Plan by being on the forefront of advocacy for history, historians, and practitioners; becoming more responsive to the needs and interests of stakeholders; and supporting historical and humanities communities in advocacy efforts—is a work in progress. It’s easy for this work to be eclipsed by responding to the constant stream of threats to the health of public history practice, but in the long-term, thoughtful advocacy work will ultimately make the field stronger. To that end, the committee would like to begin a new practice of choosing a slate of issues to advocate and build partnerships and collaborations around. 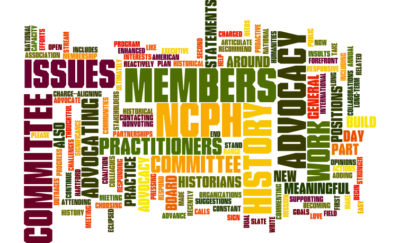 These issues related to advocacy for history, historians, and practitioners should be a) of national or international significance, and b) meaningful to NCPH’s members. 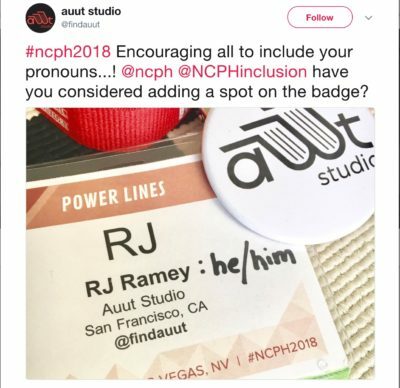 We would love your opinions and suggestions on how NCPH should be advocating for you, your colleagues, your work, and history in general. Please help the committee build a meaningful advocacy program by commenting here, contacting committee members, and by attending the Advocacy Committee’s open meeting at the Annual Meeting in Hartford. This will be the committee’s first-ever in-person meeting and will take place as a concurrent session at 3:30-5:00 on Friday, March 29 in Meeting Room 11. We hope to see you or hear from you! I would love to see an initiative to support public history in rural areas. Many rural areas lack funding, resources, knowledge, or personnel to preserve and interpret their public history resources accessibly with their communities. For example, I’m the only MA holding public historian in my community in northern Idaho and its difficult to find work and for the public to access updated history resources. Our state museum is marvelous but 6-8 hours away down a dangerous two lane highway. I’m sure this stands true in rural communities across the nation.